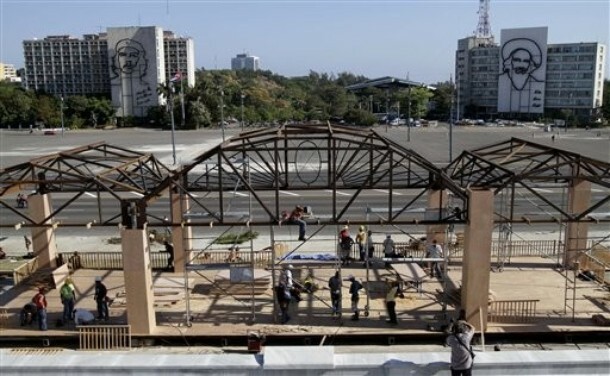 For the second time, tomorrow in Havana brings one of the most dramatic spectacles of the Traveling Pope Show, as Benedict XVI celebrates Mass under the looming gaze of Che Guevara, whose iconic etching overlooks the Cuban capital's Revolution Square. Set for 9.30am local time (10.30 Eastern), the liturgy is the final scheduled event of the pontiff's six-day second trek to Latin America. With the Volo Papale not slated to depart for Rome until evening, however, it's always possible that the remainder of the day could bring a surprise or two. 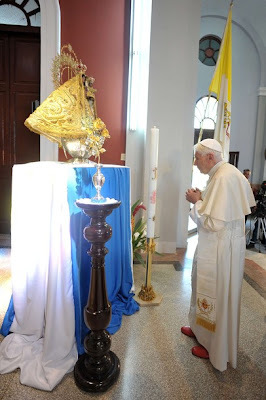 Having visited the shrine of the island's patroness, the Caridad de Cobre, earlier today (right), tonight brings an official meeting with President Raul Castro and a private dinner with the Cuban bishops. While no shortage of speculation has anticipated a papal courtesy call to former President Fidel Castro, the Vatican has remained mum, and an encounter between the two would likely only be announced after it took place. Back in Rome, meanwhile, this morning brought the release of the Pope's message for the church's annual World Youth Day, which is marked in Rome on Palm Sunday in years between its triennial summertime observance. The next of those, of course, is slated for Rio de Janiero in July 2013, which would point to a third B16 jaunt to the continent that's home to half the world's 1.2 billion Catholics. In the dioceses of the United States, the annual WYD takes place on the 30th Sunday in Ordinary Time. Or, at least, it's supposed to. Once the soon-to-be 85 year-old Pope returns to Rome, Benedict is staying off-road until the fall -- a September trip to Lebanon was confirmed by the Vatican last week.